Doha (VNA) – The National Assembly of Vietnam is always a responsible member of the IPU and ready to work with IPU and other member parliaments to implement the IPU resolutions and initiatives, contributing to building peace and sustainable development for the sake of people around the globe, Chairwoman Nguyen Thi Kim Ngan said. 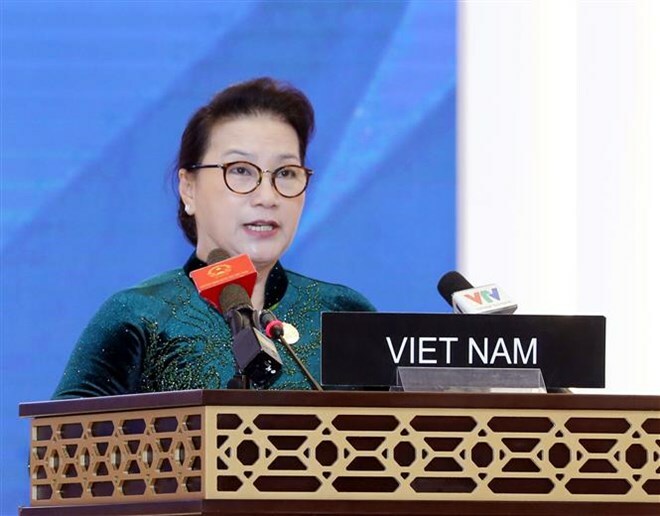 Ngan made the statement while addressing the plenary session of the 140th Assembly of the Inter-Parliamentary Union (IPU-140) in Doha, the capital city of Qatar, on April 7. The IPU-140 opened on April 6, taking in the theme “Parliaments as platforms to enhance education for peace, security and the rule of law”. It brought together leaders of parliaments, heads of delegations from 160 member parliaments, over 1,600 parliamentarians and representatives from international organisations. Ngan said peace, security, and sustainable development are the goals that require all nations to make more joint efforts to build fundamental foundations, in which education is used as an approach and also a prerequisite condition. The National Assembly of Vietnam adopted and revised many legal documents, like the Constitution, the Law on Tertiary Education, and the Law on Vocational Training, and increased supervision with the aim of raising the quality of education in Vietnam, the top legislator said. She suggested the international community continue to strengthen the peaceful and stable environment for sustainable development and focus on providing comprehensive education for everyone with the aim of preventing the seeds of conflicts and promoting international legal framework for education cooperation, boosting vocational training to improve the quality of labourers for economic development. Along with promoting the role of parliaments and parliamentarian, providing a complete legal framework, building a state of the rule of law, and supervising the execution and approval of budgets for education reform programmes, the countries should work to ensure all people access education.